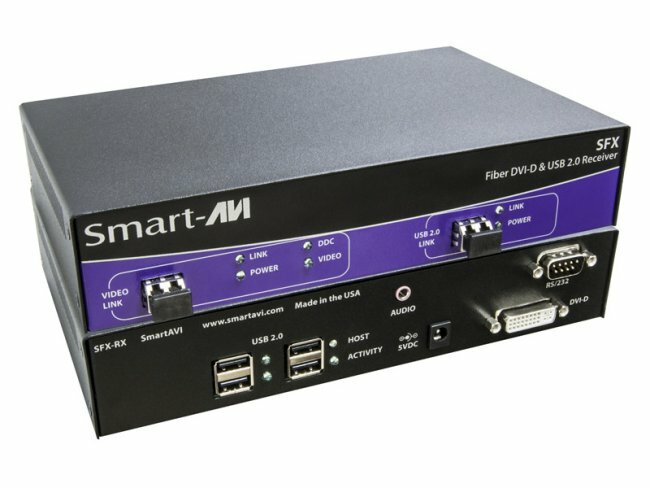 The SFX is a perfect solution for extending DVI-D and USB 2.0 signals from a computer in a remote location up to 1,500 feet (450m) away. It supports high-resolution DVI-D video and all USB device types from high-speed web cams, hard drives, printers, scanners, audio devices, touch screens, digital cameras and game controllers. The SFX is immune to electromagnetic interference, making it ideal for use in situations where there is considerable interference. The SFX is also very secure because it’s fiber optic signals cannot be easily tapped. DVI-D + USB2.0 + Audio + RS232 Extender.